This last storm brought in a little less rain than the last storm, but it brought a lot more fresh fish into the rivers. 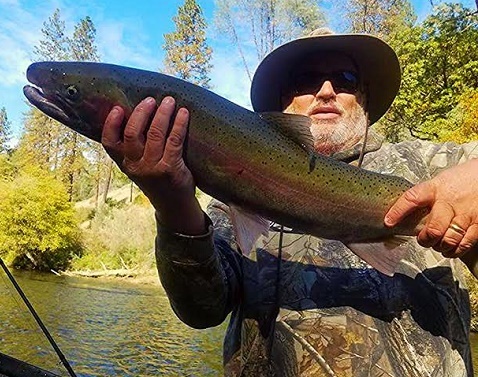 The Smith and Chetco Rivers saw a huge influx of fresh salmon while the Klamath only saw the last of any fresh salmon, but it has started the winter run of steelhead. One fisherman’s distaste and another fisherman’s delight! For the steelhead fisherman it is game on. Start tying flies and checkout leaders and lines. While the Smith and Chetco Rivers are seeing great salmon fishing, the Klamath – Trinity River Basin is closed to the take of adult salmon but you can still keep two jack Chinook salmon under 22 inches. The Willow Creek Weir is temporarily out right now due to the high water flows, but it should be back in after this next storm and the river drops back down enough for CDFW to safely reinstall it. The good news is that winter run steelhead are coming into the Lower Klamath and starting to come up the river as water flows start to drop in between storms. This next storm, expected to come in sometime early next week, should signal the steelhead to start their migration up the Klamath River. Over on the Smith and Chetco Rivers, it has started the influx of Chinook salmon and from what I have been told, there are many large Chinook salmon moving into the tide waters of those rivers. The Lewiston Dam is now down to winter water releases and is releasing 300cfs into the Trinity River.. I have not received much more information about the weir down in Hoopa at Tish Tang, just a lot of speculation and roomers of which I disregard until I do get the facts. In the meantime, TRH is still required to raise and release 300,000 Coho salmon, 448,000 steelhead, and approximately 3 million Chinook salmon of which is close to making the needed egg supply. Here’s hoping that the hatchery (TRH) does collect their egg supply for each species of fish needed to raise and release the required amount of Chinook and Coho salmon as well as steelhead in order to maintain the sustainability of the Trinity River Fishery. TRH: The hatchery has reached their egg quota for the spring run as of Sep 30; Chinook salmon entered the hatchery as of Sep. 30th, jacks 56, season total 356; adults 376, season total 1,751. Junction City Weir: Sep 30, season totals, jacks 52, adults 105; Coho, jacks 0, adults 0 (it is too early for Coho salmon), steelhead season totals, adults 60; Brown trout season totals, 10. Willow Creek Weir counts: Oct 8 thru Oct 14; Chinook salmon, jacks 2, season totals 81, adults 8, season totals 371, Coho, adults 1, season totals 2; steelhead, ½-lbs 6, season totals 46, adults 8, season totals 523. Klamath River Weir counts: Bogus Creek, 343 salmon, Shasta River 2,565 salmon, Scott River 160 as of Oct 18. Fishing: Last week, fishing in the Lower Trinity was very hard due to the high waters. Up river, around Del Loma, fishing for steelhead was slow due to the lack of anglers. Junction City on up was very good but the J C run was a little crowded. Todd LeBouf, of Tiger T guide service, fished the J C to Pigeon Point section and was able to hook 10 and boat 5 adult steelhead to 10lbs. On the second day, he fished the same run taking Gary Heffley of the Redding Sportsman’s Warehouse, and was able to land an 11lb. steelie for Gary. This was Gary’s first steelhead he ever caught and what a start to steelhead fishing. Todd fished plugs both days and worked the tail outs to get their best hook ups. The Upper Trinity fished well as there was less traffic which meant less fishing pressure. Most of the fishing from Old Bridge down to Steel Bridge was fly fishers and I was unable to find out what flies worked best. Sorry! After this coming storm I would expect that steelhead fishing should start to really get hot after the river starts to drop. Mid-Klamath: Iron Gate is releasing 1,060cfs so the I-5 to Iron Gate should be fairly good fishing but as you get down to Happy Camp, the river is flowing 1,920cfs and Orleans is 3,530cfs, so I would expect that section of the Klamath would be very hard to fish as would be the Weitchpec area. Lake Conditions: Whiskeytown is 97% of capacity with inflows of -9cfs and releasing 246cfs into Clear Creek; Shasta is 59% of capacity (decrease of 1% &1ft), inflows are 1,1157fs and releases are 5,733cfs; Keswick is 93% of capacity with inflows are 5,857cfs and releasing 5,495cfs; Lake Orville is 44% of capacity (a decrease of 0% & minus 0ft), inflow is 1,214cfs and releases are 243cfs; Lake Folsom is 33% of capacity (plus 3% & plus 3ft), inflows are 1,802cfs and releases are 1,014cfs. Trinity Lake: The Lake is 119ft. (an increase of 2ft.) below the overflow and 39% of capacity (1% increase) Inflow to Trinity Lake is 380cfs and the Trinity Dam is releasing 318cfs to Lewiston Lake with 20cfs going to Whiskeytown Lake and on to the Keswick Power Plant with 5,495cfs being released to the Sacramento River. Trinity River Flows and Conditions: Lewiston Dam releases are 308fs, water temps are 52.21.3 and air is 6551 degrees at 20:00 p.m. today. Limekiln Gulch is 4.6ft at 255cfs, water temps are 52.2 and air is 64. Douglas City is 6ft at 324cfs, water temps of 53.8 and air is 65.Junction City is 1.3ft at 340cfs. Helena is 8ft at 437cfs with water temps of 54.5. Cedar Flat is 2.9ft at 631. Willow Creek is estimated at 1,222cfs, air is 62 and water at 54. Hoopa is 12.4ft at 2,270cfs with water temps of 5.6 Flows at the mouth of the Trinity at the Klamath are estimated to be 4,800cfs. Mid-Klamath: Iron Gate Dam releases are 1,060cfs. Seiad Valley is 2.9ft at 1,740cfs. Happy Camp is estimated at 1,920cfs. Somes Bar is estimated at 2,695cfs. Orleans is 4.5ft. at 3,530cfs. Klamath River at Terwer Creek is 10.1ft at 6,640cfs and water temperatures of 54.7 degrees. Flows at Smith River, Dr. Fine Bridge are 7.8ft at 2,230cfs. Temperatures in the Valley last week were 64/45 degrees with 1.6 inches of rain with a season total of 9.9in of rain and 0.00in. of snow. Temperatures in the valley next week are expected to be 70/44 degrees, with some showers and rain at the end of the week and then scattered showers for the weekend.